When it comes to digital marketing, Search Engine Optimization and Pay Per Click Advertising to provide the basis for a successful marketing integration strategy. A holistic approach to your business marketing will offer increased traffic and relevant content that will boost conversions across all your products and services. While SEO focuses on long-term organic traffic and PPC is based on short-term, these two digital marketing channels are essentially two sides of the same coin. Since PPC and SEO are based on search queries, you can leverage the benefits of your online marketing by positioning your company at the top of the search results. This combined effort ensures that you retain a dominant position and drive qualified clicks. If your business wants to learn about your customers and drive traffic, then your online marketing approach will need to have an integrated digital marketing strategy based around SEO and PPC. Simultaneously running organic and PPC campaigns will give you double the data to analyze and use for your online marketing strategy. Running a PPC campaign can provide you with in-depth statistics you can use to understand the needs of your customers. As Google Adwords decreases the amount of keyword data it provides, many SEO teams need a workaround from the ‘no provided’ results. Since your business requires accurate data to understand your customers, then you need to utilize all data sources available. Google AdWords offers a wealth of knowledge and insight for online marketing. 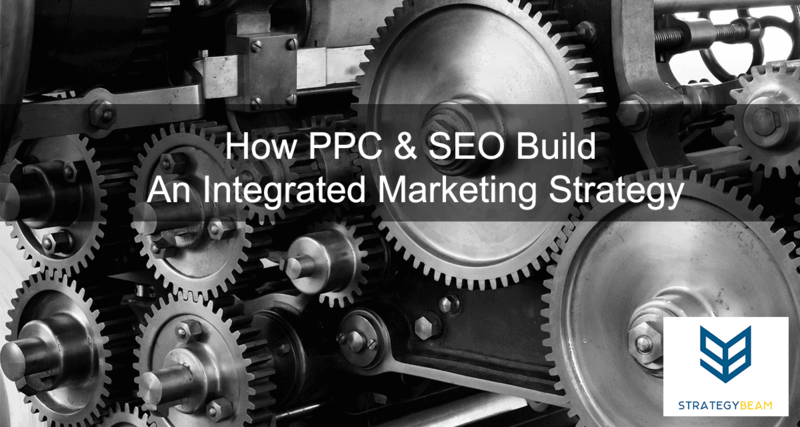 Using PPC data helps guide your marketing integration strategy, and that data can be used to support SEO and commercialization activities. Quality Score is one aspect that SEO content writers can use from AdWords to improve content marketing for your business. Referring the Quality Score can help your digital marketing team optimize landing pages and layout of your pages. Your competitors are working hard to attract similar customers that you are trying to convert. PPC offers a broad range of data to identify new competitors in your market. This information is also great to help you understand how your content and keywords rank compared to the competition. With a marketing strategy integrating PPC and SEO data, your business can identify online marketing competitors. Using tools like the “Auction Insights” report in AdWords help you analyze competitor impression share you will be able to review how your SEO team can leverage content to improve online rankings. Sometimes your business will experience negative PR and news in the community. If this happens to your business, you can use an integrated digital marketing strategy that uses PPC and SEO to increase visibility. Using keyword insights from AdWords and Google Analytics, your business will be able to find opportunities to drive positive impressions. An excellent example of using PPC and SEO to overcome negative PR was seen after the Gulf oil spill. Following the oil spill, BP paid for PPC ads related to the keyword “oil spill.” Once the ad was clicked on, the reader was led to a BP page related to their efforts to clean up the mess. Combining their PPC and SEO efforts, BP was able to showcase their efforts and rebuild their brand. If you want your business to grow, then you need an integrated digital marketing strategy. Instead of relying on a single approach, your business needs to use multiple channels in unison. Leverage the power of PPC and SEO; your online marketing efforts will drive conversions. Shoot us a message to get your integrated marketing strategy!